We’re proud to announce that our Agent Scripting App for Zendesk has been approved in their marketplace! Persistent Sessions: If an agent closes a ticket, and opens it again, the Zingtree will reappear in the same state as it was previously, with the history intact. This is also true if another agent opens the ticket. Back & Reset: The Back button removes the last item from the History. The Reset button deletes the entire history, and returns to the top of the tree in case you need to start over. 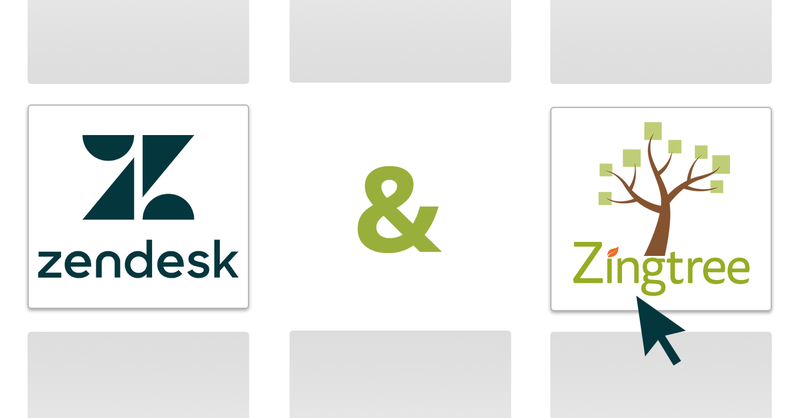 Zendesk Tagging: Add a tag to any node using the Zingtree Edit Node tool. When that node is opened in Zendesk, the tag gets copied to the Zendesk tags for the current ticket. Likewise, if the Back or Reset buttons are pressed, the tag is removed. Customizable: Use a custom CSS file to override the default look and feel of your trees within Zendesk. Zingtree uses Bootstrap 3, so any Bootstrap 3 compatible CSS theme can be used or modified. Valuable Reporting: Watch the step-by-step history of each agent interaction. See which Agents or which Nodes are taking the most time. Automatic Agent Detection: The Zingtree Agent Scripting App automatically determines which agent started each session, so there’s no setup or provisioning needed for getting good agent-centric reporting. Learn more about using Zingtree for live Call Center scripting here.